No.5 Southgate Street, Launceston | Launceston Then! No. 5, Southgate Street, Launceston. 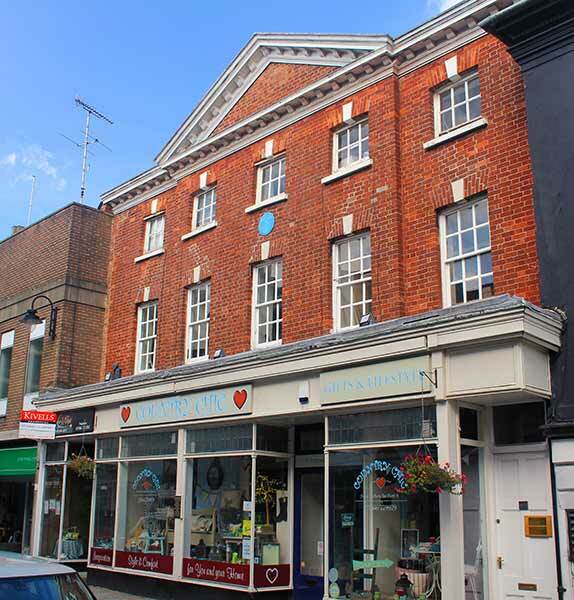 Built as a large town house and shop by Philip King, a ‘clothier and father to Philip Gidley King’, in the early to mid-eighteenth century, No. 5 was subsequently occupied by a Mr Nicolls – selling clothing and groceries – and later by Cookes stores, prior to Woolworth’s arrival. The Kings Arms (now the Bakers Arms) was built on the then gardens of No. 5 which is the reason for it to be called ‘the Kings Arms’ and not through any Royal patronage. When it was taken by Mr John Nicolls from Philip King, he had part of the front removed and inserted “the first Plate-Glass window in Launceston. Shoppers queued from 4.30 am to 9 am for the opening of Woolworth’s store in Launceston. The first three through the doors were presented with tea sets by the manager, Mr M J Norris. 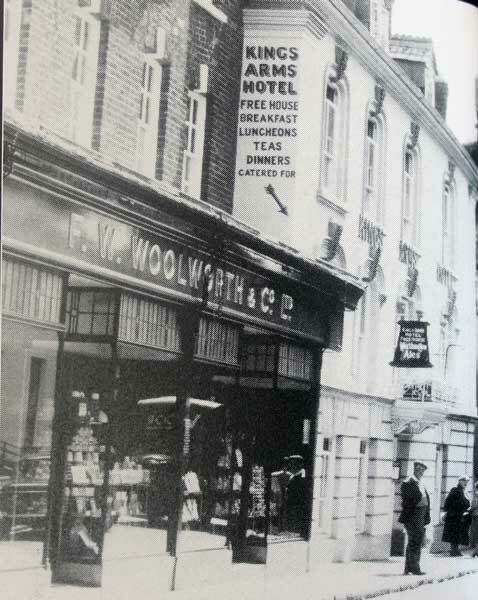 When Woolworth’s moved into No.5 Southgate street in 1953 it was their first ready-built shop purchased in Britain; all other stores up to that time had been purpose-built. The shop soon became a firm favorite for shoppers and served the town for nearly 20 years. However, due to the difficult access to the rear and after many unsuccessful requests to planners to modernise the building, Woolworth’s closed the store down leaving the historic building’s future in some doubt. 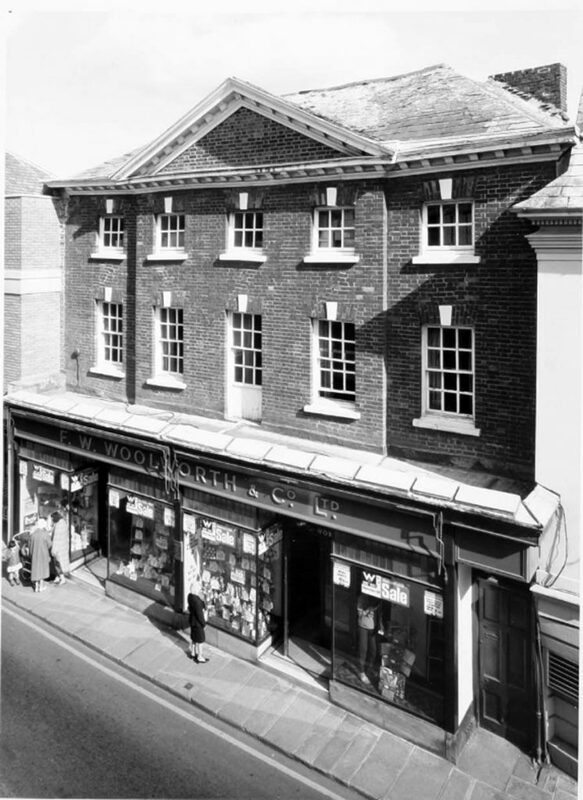 F. W. Woolworth, 5, Southgate Street, Launceston in 1969. 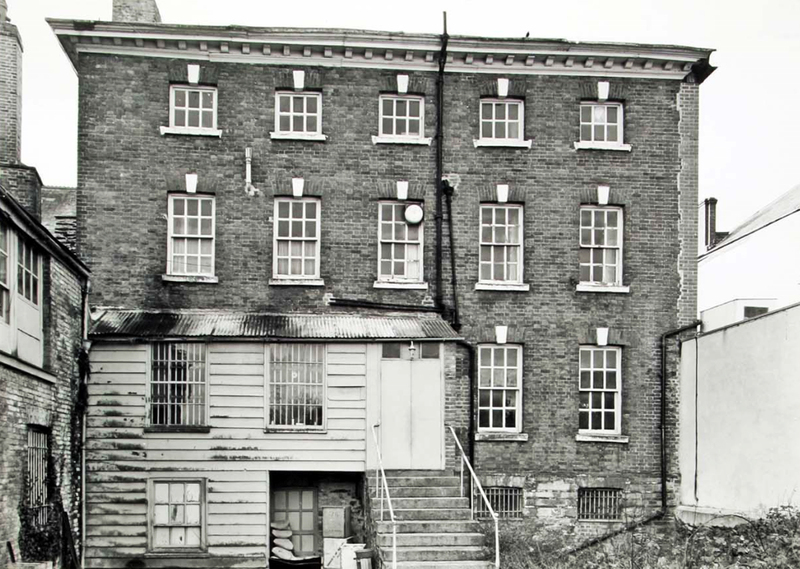 The rear of 5 and 7 Southgate Street in 1969. Newspaper reports: September 3rd, 1973: STORE COULD COLLAPSE, LETTER ALLEGES. An old building in one of Launceston’s busiest streets could have collapsed any time in the last three years, according to a letter in the files at the Department of the Environment. The building – a three storey Georgian house – was used as a retail store until recently by Woolworth’s, but the company pulled out after it was not allowed by the Government to rebuild. Conservationists objected to Woolworth’s proposals for the building, and the planning application was called in by the Department of the Environment. This week-end it was revealed that the now empty building has been bought by a development company and it is believed that the letter may be used as a lever to get permission for its own development plans. The letter, sent to the department by a London firm of solicitors, acting for Woolworth’s, was accompanied by a report on the building prepared by a top consultant. The letter says; “The building could well collapse one day if urgent works of rebuilding are not soon carried out”. And it gives the opinion that the situation has existed since before November, 1970. The company which has bought the building is Beadle Property (South-West) Ltd., a subsidiary of Beadle Property Holdings, Ltd., of Hertford. A spokesman for them said they were very much at the preliminary planning stage at the moment. A Georgian building which the old Cornwall County Council said should not be demolished, is in such a bad condition that it could collapse, a public inquiry was told yesterday. According to experts the three-storey building, once occupied by Woolworth’s in Southgate Street, Launceston, is past repair and should be knocked down. The inquiry at Launceston is the latest round in a six-year planning battle over the future of the building which turned into a major row in 1973 when Woolworth’s said they had had enough and closed their shop. Since then the building, listed as being of historic and architectural interest, has remained empty. The new owners, Beadle Property Holdings Ltd., want to demolish the building and redevelop the site with shops and offices. But when they made their planning application they found that the long history of planning controversy had taken a confusing turn. The county council, who had supported two separate applications from Woolworth’s to demolish the building, changed its mind and decided to refuse permission for listed building consent. Woolworth’s had managed to negotiate its way clear of local authority planning objections, but had its applications on both occasions called in by the Department of the Environment. Why the county council changed its mind was one of the questions to which Beadle sought an answer to at yesterdays inquiry. Mr Donald Yarsley, an architect in the county planning department, told Beadle’s representative that this was due to the considerable change of emphasis on the conservation and preservation of listed buildings. Mr DJ Clare, for Beadle, said there was a lot of concern when the county council gave permission on the two previous occasions, the last time being only a year before the existing application had been made. The same amenity societies had made their views known than as now. Mr Clare pointed out that one of the council’s reasons for refusal was that the building could be retained without involving undue expense in addition to that incurred by demolition. No one from the county council had inspected the inside of the building, he said, and they could not therefore have any idea of the cost which would be involved in refurbishing the property. Mr Alan Coker, a structural engineer, said that if temporary props were removed from the building it would collapse within days. He could state categorically that there had been recent movement in the front wall. Mr Samuel James, North Cornwall Council’s Chief Building Control Officer, said he did not consider the building was dangerous to the public, but under cross-examination he admitted that he would be alarmed if the building was to be used again in its present condition. The inquiry will continue this morning. North Cornwall Planning Committee yesterday answered an allegation that it had ignored a warning over the dangerous condition of a building in a busy Launceston shopping street. The building – a Georgian house at Southgate Street, Launceston, which until two years ago had been used as a Woolworth store – was the subject of a public inquiry into demolition plans and the allegation was made by a solicitor acting for the present owners, Beadle Property Holdings, Ltd.
Beadle claimed that they warned the council last year that the front wall of the three-storey building could collapse into the street, but they had received nothing more than acknowledgements of their letter and subsequent reminders. Yesterday, Mr John Windskill, the council’s administrator, told the Planning and Development Committee that so many meetings had been held with Beadle that it was not considered necessary to send a reply to the letter on top of this. Mr Windskill said that at the present time the council’s officers did not consider the building to be dangerous from the point of view of people on the highway. If it was, the responsibility would be that of the County Council, who would then serve notice o the owners to make it safe. Brig Edward-Collins said it was accepted that the building was unsafe inside. The public inquiry at Launceston was told by four experts called in by Beadle that the building in its present state represented a danger to the public. The front wall, the inspector was told, was not connected to the side walls. The Secretary of State’s decision on whether or not the building can be demolished will be made known later. Permission to demolish the old Woolworth’s building in Southgate Street, Launceston, has been granted by the Secretary of State for the Environment. The Minister announced this week that he had accepted the recommendations of the inspector who held a public inquiry at Launceston. The inquiry has been held into the appeals by Beadle Property [South West] Ltd., against the decisions of the old Cornwall County Council to refuse planning permission for the erection of a new retail shop and offices at 5-7 Southgate Street, Launceston, and to refuse listed building consent for the demolition of the existing premises on the site. The Minister has accepted the inspector’s recommendation not to allow the erection of the new building as proposed by Beadle. It was felt that the proposed building was too much like the SWEB premises and not in keeping with the high standard of design necessary. “The attraction of this street lay in the varied age and style of its individual buildings and the inspector did not think that it was impossible to design a new building which would be representative of this age and in keeping with the traditional ‘ad hoc’ development of the existing buildings in the street”, says the Department of the Environment’s decision notice. The permission to demolish the old Woolworth’s premises – the birthplace of Philip Gidley King, in whose honour Launceston, Tasmania, was named – is conditional upon the Venetian window in the south-east wall of the Georgian building and the existing unslighted basement walls being retained for incorporation in the replacement building. The inspector considered that the rebuilding of the front upper storey’s as a replica was unlikely to be satisfactory for he doubted if the finished building would look like a true Georgian building. If such a replica was not used as a town house it would, he thought, be a dishonest building which was born old [and therefore deformed] and be a contradiction of the positive objectives of creating Conservation areas. The existing structure was generally, beyond reasonable repair and the presumption that the building should be preserved did not outweigh the practical difficulties in doing so. The inspector had concluded that the north-western cross wall of the existing building was in a dangerous condition and inadequate to bear the load of the roof and some upper floors. The inspector was not convinced, however, that the wall on the first and second floors of the front elevation was in imminent danger of collapse, as stated at the inquiry. He did agree that the brickwork was ugly, much of the cornice might be beyond repair and that it would be difficult to match the existing brickwork and make the necessary cross-ties through the brickwork unnoticeable. Some of the floors and ceilings in rooms on the first and second floors were likely to collapse and the present support for the main chimney stack was inadequate. Very little panelling remained and the inspector considered that the whole of the present interior was of very little architectural interest, but the gutting of the inside would weaken the remaining outer walls and make their renovation even more difficult. The Minister has supported the suggestion that a suitable plaque concerning the connection with Philip Gidley King should be displayed. And he has said that it is desirable that demolition should not be put in hand until suitable plans for a replacement have been agreed and the work can follow demolition without delay, thus avoiding an unsightly gap in the Conservation Area. District Councillors in North Cornwall are worried about the structural conditions of the three-storey ‘Old Woolies’ building in the heart of Launceston conservation area. Members of the council’s planning committee were told that at the rear of the property, owned by Mr Peter Gillbard, the roof was sagging in the middle with a large hole having appeared in a wall. Committee Chairman, Councillor Richard Willoughby, said he was most concerned about the structural condition of the building formerly owned by Woolworth’s. It was taken over by Mr Gillbard and turned into a furniture and fashion store with the French Connection night club in the basement in the mid-70’s, but the furniture and fashion store was closed last year. Mr Gillbard has since leased the night club to Mr Michael Foster, and has announced plans to turn the building into a ‘mini-market’ comprising lock-up stalls with low rents ideal for young people to run their own business. Councillor Willoughby said it was not for councillors to express an unqualified opinion, but looking at the building led one to believe the structure was not as it should be. The committee agreed to urge the council to allow planning officers to discuss the situation with Mr Gillbard. 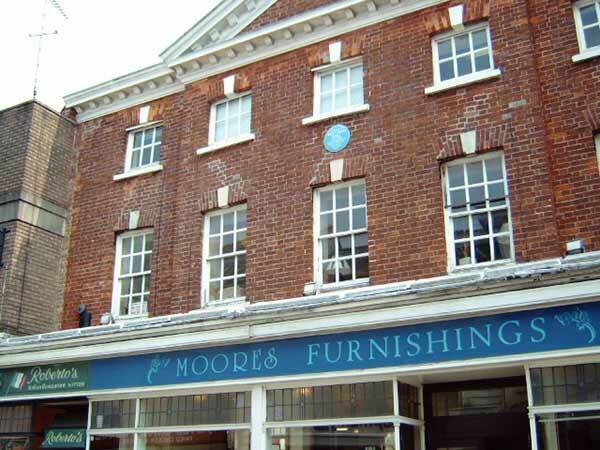 2008 – Moore’s Furnishing quit the house, which was handed over with the same business. C.18. 3 storey’s. 5 windows. Red brick. Modillion eaves cornice, 3 centre bays break forward slightly and are pedimented. Slated roof. Cambered flat arches with white stucco key stones. Double hung sash and thick glazing bars. One Palladian window at staircase on south side. The Ground Floor is entirely taken up by a modern shop, but 2 plaster ceilings survive here substantially intact. This building is also very important on account of its outstanding rear elevation also of red brick with 5 windows, keystones, double hung sash and glazing bars and medallion cornices. At one time a house comparable with Castle Hill House and Eagle House. As we can see from these newspaper reports quite a fight has been fought between developers and planners of the subsequent years but the building has been saved and is now occupied by locally owned Country Chic (below)a gift and lifestyle shop and in the basement a new restaurant called the Firebrand has opened in the basement.